I can guarantee you that this meat ball is really delicious. It's one of the foods that i cooked last New Year's Party. I will share to you the recipe of this meatball. 1. Preheat oven to 375 F. Combine stuffing mix, water, egg and dressing until moistened. Add meat and cheese; mix well. 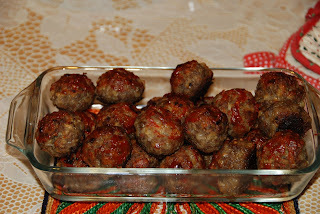 Shape into small meatballs or the size you want. 2. Place on greased baking sheet; spread with ketchup. Serve with hot cooked rice and steamed broccoli. Added your blog na sa Home & Garden! I will pod nako sa uban nako nga blogs if makalugar! Happy New Year!! Lami man basin magluto ko ani this weekend!! !